I have spent a lot of time talking about all the things that make being a student nurse hard. From the logistics of childcare to the psychological impact of placements, I have made a habit of shouting about the negatives amid the cries for nurse positivity. I am currently taking a year out due to my mental health hitting the skids in a reasonably terrifying way during my last placement. I loved the first year of my degree, I adored my first placement so much I came close to accepting a job there. Being a mental health nurse is something I want to do, a job I could see myself never getting bored of. However, as much as I want to become registered and enjoy a long and exciting career it is not something I am prepared to make myself ill or miserable for. I am therefore faced with the very difficult decision of whether or not I will return when my year off is up or whether I will join the statistics as yet another nursing school dropout, just another number in the attrition rates. One of far too many. 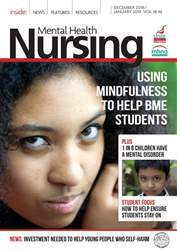 This issue of Mental Health Nursing contains a variety of news, views , features and resource reviews.